The first SCBWI conference I attended made me realize that I had a thing or two to learn (okay, maybe more). In particular, I had to learn the lingo. Imprint? Isn’t that what happens when you adopt a flock of ducklings and assume the role of their mother? SDT? Is that a social disease writers get when they don’t get to write often enough? And don’t even get me going on F & G’s! · Advance: Money paid to an author before the book is published. The amount of the advance must be earned back in royalties from book sales. · Agent: Someone who acts on your behalf, selling your manuscript and negotiating your contract with the publisher. · Antagonist: The villain of the story. · Anthropomorphism: Giving human characteristics to animals. · Acquisitions Editor: The editor who acquires or signs up manuscripts. · Cover Letter: A letter sent with your manuscript to briefly explain your story and introduce yourself. · Dummy: A manuscript that is laid out in book form, with one or two pieces of finished art. · E-book: A book that is read only in an electronic format, instead of printed format. · E-zine: A magazine that is read only in an electronic format, instead of printed format. · F & G’s: Folded and gathered loose sheets. The unbound pages of a finished book. · Fiction: Writing from the imagination (“made-up” writing). · Format: The physical appearance of a book. · Imprint: A small, subdivision of a publishing house that usually publishes a distinct type of book(s). · ISBN: International Standard Book Number. This gives each book a unique identification number. · Masthead: The place in a magazine where the staff is listed (usually near the front). · Multiple/Simultaneous submission: When an author sends the same manuscript to more than one publisher at the same time. Some publishers DO NOT like this practice, therefore always check publisher’s guidelines. · Non-fiction: Factual or informational writing. · Personification: Creating characters out of non-living objects. · Protagonist: The hero of the story. · Query: A letter sent to a publisher to inquire if they would be interested in reviewing your work. · Regional publisher: A publisher who specializes in books about certain areas of the country. · Rejection letter: A letter from the publisher declining to accept your work. · Royalty: Money paid to an author, based on a certain percentage of the price of the book times the number of books sold. · SASE: Self-addressed stamped envelope. · Self-publishing: When an author publishes his own book, assuming all production and marketing costs. · Show-Don’t Tell (SDT): A common term used by editors meaning that you need to show what is happening in the story (rather than tell the reader what is happening). · Slush pile: All of the manuscripts that a publisher receives that he did not request. It takes editors months to review the slush pile submissions. · Unsolicited manuscript/submission: A manuscript that the publisher did not request from the author. · Work-for-hire: When an author is paid a flat fee for their work, usually giving all rights to the publisher. 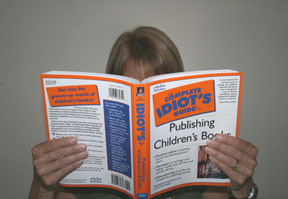 *Note: The book featured in the photo, “TheComplete Idiot’s Guide to Publishing Children’s Books” by Harold Underdown has an even more extensive list of terms. Hi Eugie,You’ve make a good point, but I think there’s a tiny difference. I believe that multiple submissions (plural) refers to sending more than one ms to an editor (different mss, same editor), a practice not followed too much these days. A multiple submission (singular form) would refer to sending a single ms to two or more houses (same ms, different editors). This term seems to be used interchangeably with the term “simultaneous submission” and is the more common practice nowadays (although some houses don’t appreciate this practice, so always check with publisher guidelines before submitting).